WIP" posts any more. But, I figured I should post up something on this project and break my rules, as it's a slow process and taking up all of my hobby time. I'll keep the chat down, since I'll be going over my thought and planning process in the final post. But for now I'll share some small details. Here is the Keeper, since he's a necromancer I wanted him to have a pale skin tone and actually was going from something along the lines of greyish blue. I started with a mix of blue and flesh tone and worked him up from there with more flesh tone. These are the Keeper's Zombies. These guys are super awesome and the main reason I backed the Kickstarter in the first place. A lot of time zombies look cartoony or the artist attempts to be overly grotesque. 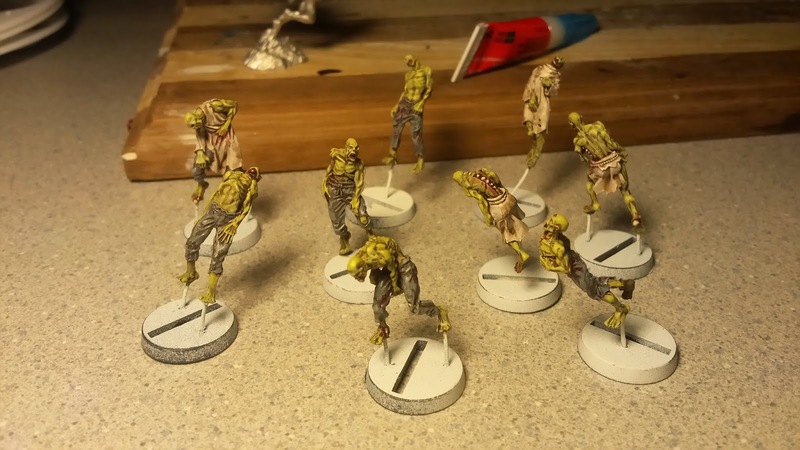 Not these ones, they are more on the realistic side and while some parts of them are obviously deteriorated, a lot of the bone and gore parts are my own paint effects. This picture is from after their pants were finished, but before the white cloth sections were completed. And finally, we have the base.The base went through multiple planning stages before I settled on this. 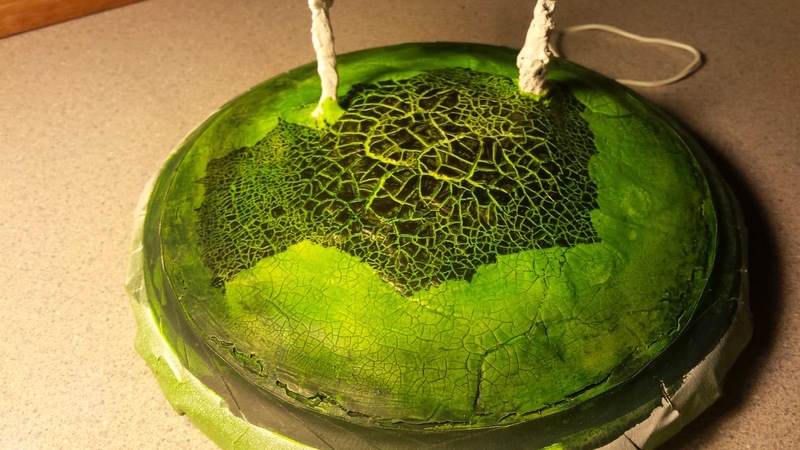 The cracks are made with crackle paint and it is now going through the long process of picking out the cracks and painting the ground. At this point, the black that is painted on is somewhere around 6 hours of work and it still need sand glued on and painted. It's because of the way I am doing the base that this project is taking much longer than I expected. The plan for the base is to paint the ground black, then glue sand on to the raised sections, followed by another coat of paint on the sand and then finally dry brushing the ground from black in the center to brown on the edge. Once the paint is finished, I'll be using static grass heavy on the edge and thin the closer it gets to the middle to simulate foul magic withering the ground cover. There's lots and lots of work ahead befoe this project is finished. But I think it's turning out to be pretty good so far. RedBox Zombies are my fav zombie sculpts out there, though I've yet to purchase any. I got the Keeper during that Kickstarter too. Flippin loved painting him up. Really good detail and a creepy face on that fig. I like where you're going with this. The plans for the base itself sounds super cool. I like a lot of Red Box's stuff. I ended up getting these, plus Robert, Whistlelock, Ysra and the KS exclusive Svetlana too. I really need to pick up Fenris the Dire Wolf and a couple of their Dwarves as well. For awhile I was debating on using LEDs and the clear crackle paint to create an actual illuminated base. But decided against it because I wasn't sure how to actually pull it off. It wasn't until later that I saw some Tea Candle lights on Twitter that would have made it possible. Hoping all the time it's taking to paint the crackled ground will be worth it. I've said it before, every project gets to a point where I'm not sure I dig it, and then it just somehow works out. Hopefully when it's all done it doesn't disappoint!